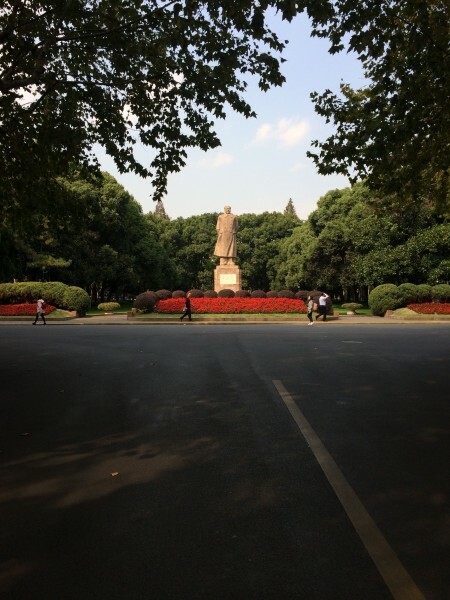 In November 2018, I was fortunate enough to travel to Fudan University (Shanghai, China) to be a “Foreign Expert” at their library. I, and my colleague Jim Ottaviani, were not the first librarians from University of Michigan Library to travel to Fudan under this program, so we had the benefit of the experience of these previous librarians to inform our preparation for and time spent at Fudan. We were asked to apply for the program by the U-M Library Asia Library unit. The request came to the Asia Library from Fudan University, that they were looking for librarians to come give presentations and workshops about the digital library, digital publishing, and digitization. Our Asia Library chose us! The fourth presentation was one that they did not specifically request, but was a large part of what I do every day in my Digital Content & Collections department, therefore my expertise. We weren’t sure it would be relevant, but we decided to offer it regardless. In the end, it ended up being quite relevant - as a result of giving the presentation to the librarians at the Science library, we were asked to provide more specifics to another group of librarians at the Humanities library. Surprisingly, the details of our digitization process were quite useful. While their Special Collections department has been in place for a long while, exhibiting and preserving their materials in digital form is something new. A new librarian (who recently finished her library degree at Simmons College and returned to Shanghai to work at Fudan) was eager to hear details. Even sending her the specifications we have for digitization seemed to be a huge boon! Probably the most successful of the presentations was "Copyright and Privacy." This seemed to interest them greatly, and our approach to bringing in copyright consultation expertise to the library and workflow around copyright clearance for individual objects and collections seemed to resonate well. In addition, we received a primer on Chinese law (and history) that helped us understand the necessary differences in our workflows because of our different laws and rules. Definitely, the presentation to the LIS students was a success as well. The teacher - whom we had interacted with daily since our arrival, and who had worked at NYU for a number of years - was very grateful for all our advice to the students, especially in our future thinking on the value of librarianship world-wide. This presentation felt like we were really teaching and mentoring, and that the information we were providing was well-received by everyone. We were given a tour of their brand-new medical library and their several-years-old law library, both fascinating examples of architecture and functionality. In addition, we were offered what seemed an opportune view into a major archival project of the University. The copyright session was attended by a senior faculty member (Prof. Zhang Letian) who has gathered a huge trove of rare materials on commune and village life during the Cultural Revolution. He's interested in partnering with the University of Michigan and other U.S. institutions (including HathiTrust Digital Library, if appropriate) to provide access to these rare and unpublished materials. The University of Michigan is a founding member of the Coalition for Contemporary Chinese Social Life Archive (CCCSLA), which was initiated by Fudan and would be a partner/sponsor of this effort. We expect there will be more trips to Fudan from the University of Michigan, and we will be happy to share our expertise (?!) with those who will be traveling. It is a fantastic opportunity to better understand the culture of librarianship in another country, while in the process of sharing information about our own culture. If you’d like to learn more about our takeaways or the intentions of U-M Library with this program, please contact me at khage@umich.edu.